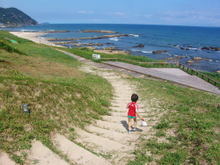 Today it was very beautiful and hot, so I went to the beach with my son, Yuuki. This beach is called "Shirahama Chuou Beach" located next to Shirahama Ohama Beach. There are white sand and rocks, we can swim and play with sea animals. After parking our car in the nearest parking lot we started to go to the beach. This entry was posted in beach, Family on 2008年9月1日 by izusakuraya.